Is your skin itchy, oozing, or breaking out? Moles, rashes, hives, and eczema are just a few of the more than 3,000 skin disorders that affect people every day. Changes in color or texture can result from inflammation, infection, or allergic reactions anywhere on the body. Some skin conditions can be minor, temporary, and easily treated -- while others can be very serious, and even deadly. Read on to see signs and symptoms of the most common skin disorders and learn how to identify them. Herpes zoster, also known as shingles, is caused by the return of a chickenpox infection from latently infected nerve cells in the spinal cord or brain. It begins as a painful sensation which is often mistaken for a musculoskeletal injury or even a heart attack.. It is soon followed within one or two days by a red, blistering unilateral (one-sided) rash distributed to the skin supplied by a sensory nerve (a dermatome). 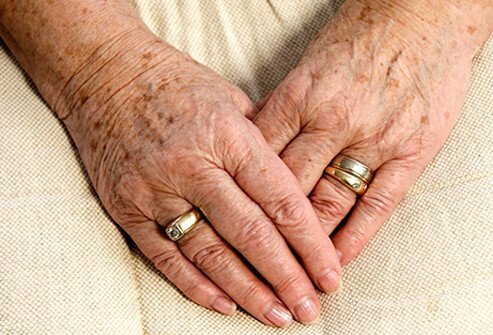 Zoster tends to occur most often in the elderly and can be largely prevented or made less severe with a vaccination. Treatment with antiviral drugs within 48 hours of the onset of the eruption may limit the development of a persistent, severe pain (neuralgia) at the site of the eruption. 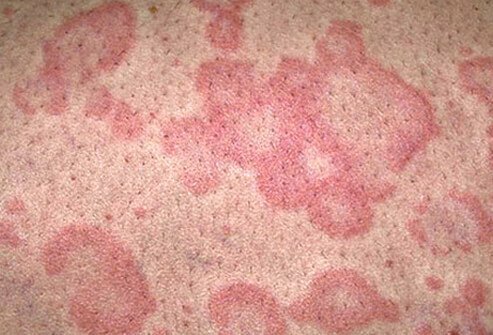 Hives, also known as urticaria, is a very common allergic skin condition most often due to antibodies in the bloodstream that recognize foreign substances. This eruption appears suddenly anywhere on the body as elevated blanched bumps surrounded by an intensely itchy red rash. There may be many lesions, but each one only exists for eight to 12 hours. As older ones resolve, newer ones may develop. Most of the time, urticaria resolves spontaneously within eight weeks and is treated with oral antihistamines for symptomatic relief. 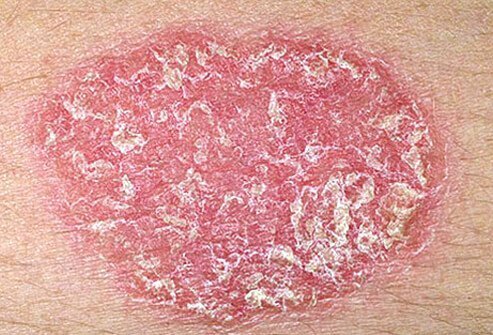 Psoriasis is a chronic, inflammatory genetic condition in which patients develop scaling red bumps that coalesce into plaques and typically occur but are not limited to the scalp, elbows, and knees. Psoriasis is not curable; it can come and go by itself. There are a variety of treatments depending on the severity and extent of involvement, which vary from topical creams and ultraviolet light exposure to oral drugs and injectable medications. Patients with psoriasis more commonly develop cardiovascular disease and diabetes, which may be attributable to system-wide inflammation. Atopic dermatitis (called eczema) is a genetic condition that presents in early childhood with a chronic itchy, weeping, oozing dermatitis. It tends to localize to the arm creases opposite the elbow and on the leg opposite the knee. Many patients also have inhalant allergies such as asthma and hay fever. The condition improves with age. Treatment involves the application of emollients to wet skin and the use of topical steroids. 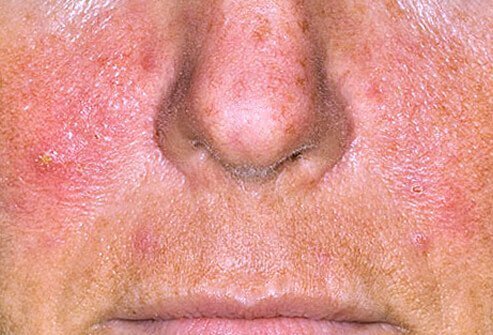 Rosacea is a chronic inflammatory condition of the face that is characterized by redness, dilated blood vessels, papules, pustules, and occasionally by the overgrowth of nasal connective tissue (rhinophyma). 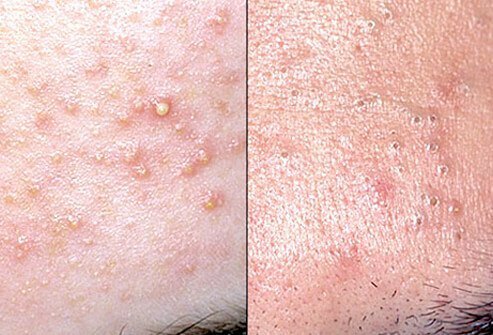 It superficially resembles teenaged acne, but it occurs in adults. Persistent facial flushing is an early sign of the skin's uncontrolled sensitivity to certain naturally produced inflammatory chemicals. Treatment of rosacea involves topical and oral drugs. 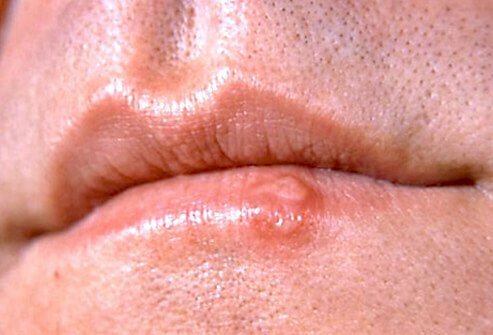 Herpes labialis (cold sore) is caused by the herpes simplex virus. Cold sores commonly appear on the edge of the lip. This virus exists in a dormant state in the spinal cord nerve cells, and after certain environmental triggers like a sunburn or a cold, the virus is induced to travel along a peripheral nerve to the same skin site over and over again. The eruption is self-limited to about seven to 10 days so that treatment is unnecessary unless the eruption becomes too frequent. In allergic individuals, the development of a linear blistering eruption occurs within 24-48 hours of exposure to a member of the poison ivy or poison oak family of plants. Since the plant contains highly allergenic chemicals, most people will become allergic after a single priming exposure. The eruption will resolve within three weeks but will occur again the next time the skin comes in contact with the plant. The repeated application of cool wet compresses to the blisters followed by evaporation of the water can be soothing and speed healing. Treatment with steroids creams or even oral steroids may be required in severe cases. Once a person is allergic, this is permanent; it is important to avoid this plant family assiduously so this very unpleasant allergic reaction will not recur. Many of those allergic to poison ivy or poison oak (Toxicodendron) are also sensitive to mango skin and cashew nut oil. This eruption occurs in areas of the skin in which hairs have been recently cut or extracted. This is commonly present in the beard area of individuals with very tightly coiled hair. When the hair is cut off or plucked out below the level of the follicular pore, it tends to curl into the side of the follicle and cause an inflammatory bump. 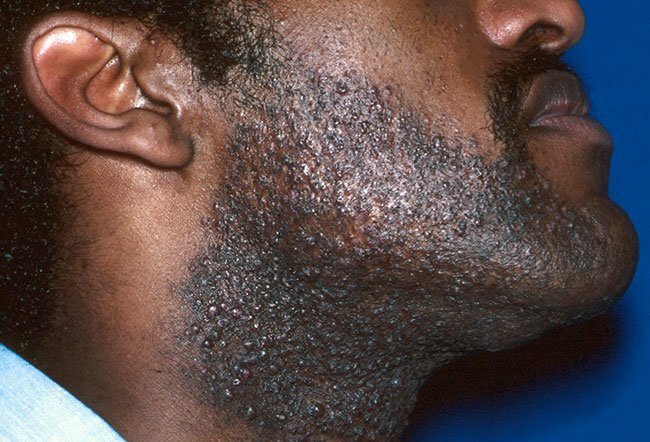 Not shaving closely is very important in preventing this skin condition. 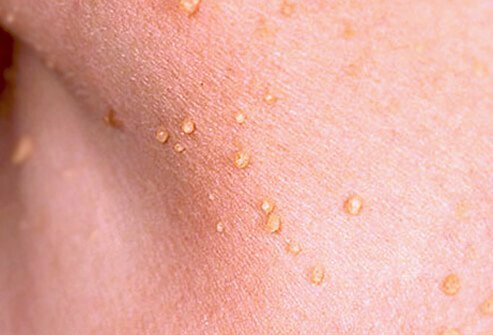 Skin tags are small, fleshy, fibrovascular, pedunculated (on a stalk) growths that are often are found on the neck and armpits. They are generally asymptomatic unless they become irritated by frictional forces or their blood supply becomes compromised. They are very common and need not be removed or destroyed unless they become irritated. Acne vulgaris is a noninfectious eruption of papules and pustules on the face and occasionally on the chest and back. It occurs in all teenagers as they progress through puberty. Comedones (blackheads) and inflammatory papules and pustules are all present simultaneously. This is not a condition of dirty skin but is mediated by hormones that begin to circulate during puberty. The condition generally resolves around the age of 20-30 but may produce scarring if severe and left untreated. One of the most common causes of athlete's foot is an infection of the dead superficial layer of the skin called the stratum corneum by a fungal mold (tinea pedis) called a dermatophyte. If inflammatory, it may produce a blistering eruption which is quite itchy. Noninflammatory tinea pedis produces a dry scaling appearance and is frequently not very irritating. Tinea pedis is probably frequently contracted by walking barefoot in locker rooms. Topical antifungal creams are available over the counter and can be helpful in treating the infection. Although the term mole may cover a variety of different sorts of skin growths, most often it refers to a localized accumulation of pigment-producing cells called melanocytes. These are generally uniform in color and round in shape. 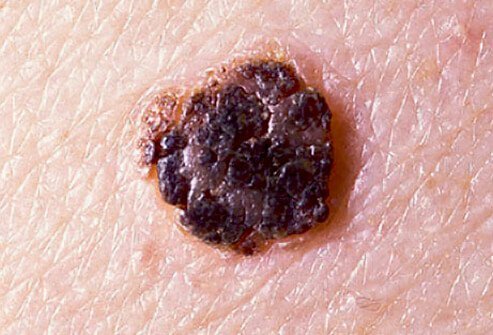 Melanocytic nevi (moles) range in color from beige to black, they're <½ inch in diameter, and are often located on sun-exposed skin. Poorly pigmented individuals may have an average of 35 of these growths by the time they are 35 years old. 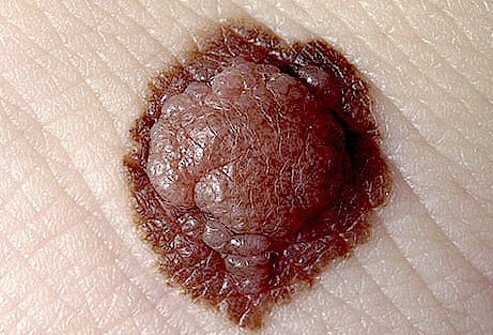 These are benign lesions but can be confused with various pigmented skin cancers. Pigmented lesions that itch, bleed, or grow could be cause for concern. 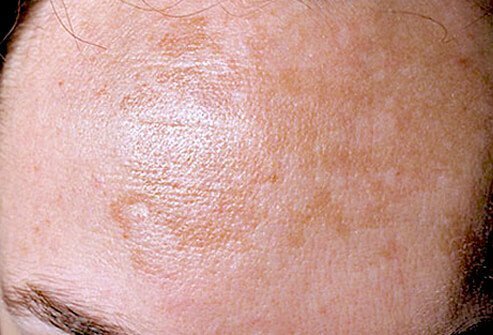 These flat brown spots typically appear on the face and forearms older individuals. Although they cause no symptoms, patients detest them because of their unsightly appearance. They can be treated in a variety of ways, but treatment is not medically necessary. 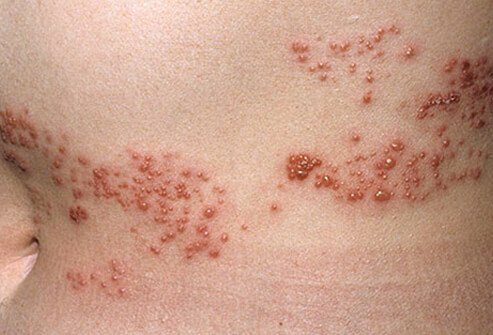 This rash usually begins in a young adult as a single scaling bump or patch and then extends to cover much of the torso with many scaling spots that are elliptical in shape. They are associated with modest itching which only occasionally requires treatment. The condition usually lasts about 6-8 weeks in total. This condition occurs most commonly in women of childbearing age and is often associated with pregnancy or the ingestion of oral contraceptive medication. This flat brownish pigmentation occurs on the forehead, cheeks, and in the mustache area of the upper lip. It often persists after pregnancy or after birth control has ceased. Sunlight will make it darker. Successful treatment is not easy, and strict sun protection is a necessity. The development of small keratotic tumors of the skin is caused by one of about 200 members of the human papillomavirus group. They often spontaneously go away, but particularly stubborn warts may require medical intervention. The proliferation of various treatments reflects the fact that successful resolution mostly depends upon the patient's immune response. There are a variety of treatments available without a prescription that ought to be tried prior to seeing a physician. This is the single most common benign bump present on people as they age. Lesions may be present anywhere on the body and generally do not produce symptoms. They appear as black, brown, or yellow bumpy lesions which give the appearance of having been "glued" onto the skin. They are of no medical significance aside from the fact that they are occasionally confused with pigmented skin cancers. 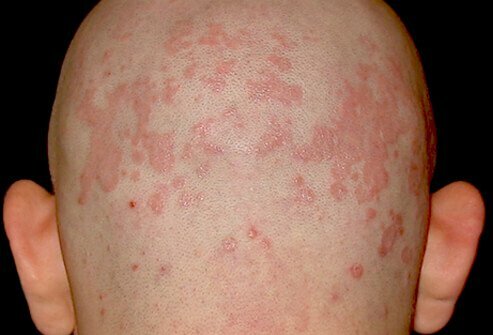 Seborrheic dermatitis is the single most common rash of adults. When it occurs in infancy, it is commonly called cradle cap. The adult disease tends to favor the scalp, skin behind the ears, forehead, brows, nasolabial folds of the face, mid-chest area, and the mid-back, producing an itchy, red scaling dermatitis. The scaling in the scalp can be conspicuous, producing impressive dandruff. The cause of this condition is unclear, but it responds well to topical steroids and to topical antifungal creams. Medicated shampoos containing tar, selenium sulfide, and zinc pyrithione are often effective. This condition commonly improves spontaneously but will ultimately recur. There is no cure so treatment must continue indefinitely. Allergy and Asthma Proceedings: "Chapter 21: Urticaria and angioedema." 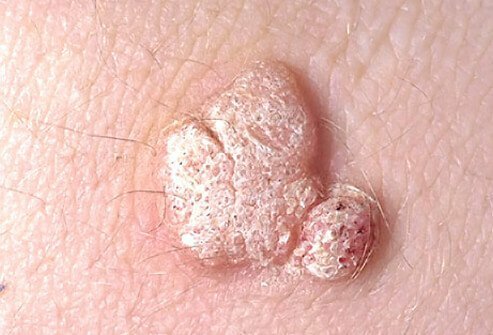 American Family Physician: "Common benign skin tumors." American Family Physician: "Diagnosis and treatment of acne"
American Journal of Clinical Dermatology: "Treatment of cutaneous warts: An evidence-based review." British Medical Journal: "The diagnosis and management of tinea." 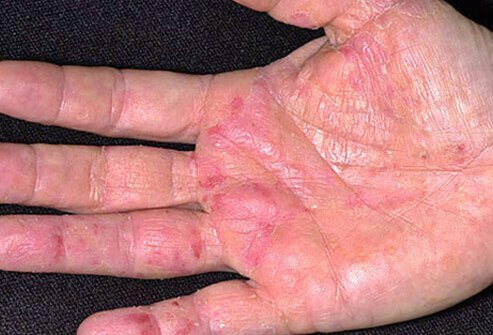 Cleveland Clinic Journal of Medicine: "Understanding and managing atopic dermatitis in adult patients." Dermatologic Clinics: "Clinical patterns of phytodermatitis." Dermatologic Therapy: "The medical and surgical therapy of pseudofolliculitis barbae." Journal of the American Academy of Dermatology:: "Melasma: a comprehensive update: part I & II." Journal of the American Academy of Dermatology: "Treatment of solar lentigines." Journal of Cutaneous Medicine and Surgery: "A refresher on herpes zoster, current status on vaccination, and the role of the dermatologist." Journal of Cutaneous Medicine and Surgery: "Are all seborrheic keratoses benign? Review of the typical lesion and its variants." Journal of Oral Pathology & Medicine: "Herpes Simplex Virus Type 1 Infection: Overview on relevant clinico-pathological features." Seminars in Cutaneous Medicine and Surgery: "Shingles Information Page." Seminars in Cutaneous Medicine and Surgery: "The morphologic universe of melanocytic nevi." Skin Therapy Letter: "Therapeutic update on seborrheic dermatitis." Skin Therapy Letter: "Treatments for pityriasis rosea." US National Library of Medicine National Institutes of Health: "A review of the diagnosis and treatment of rosacea." 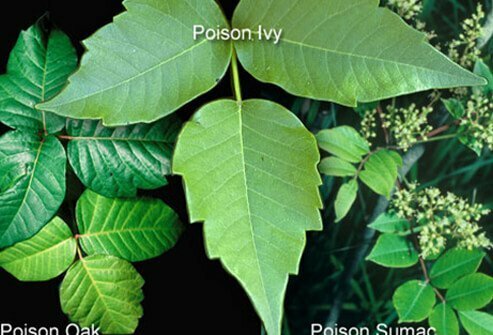 Wilderness & Environmental Medicine: "Toxicodendron dermatitis: Poison ivy, oak, and sumac."